Spooky phantoms, hauntings, and clouds of purple and green smoke fill the Newmark Theatre this Halloween season. Don’t worry, you won’t get too much stage fright. 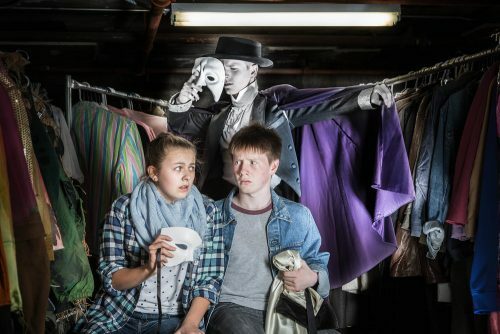 Goosebumps The Musical: Phantom of the Auditorium is a clever junior who-done-it. The gumshoeing of Scooby-Doo meets a middle-school take on Phantom of the Opera with a surprise ending. The kids will get a kick out of solving the riddles of who is the person behind the mask and laugh along with the clumsy moments of growing up. Stan Foote, artistic director of Oregon Children’s Theatre and director of this musical, again sets a high bar for a smart, funny and well-staged musical for younger audiences. Like any good children’s art, Goosebumps entertains adults, as well. It’s always a thrill to see young actors in professional productions hit their notes, dance steps, and lines as well as their older counterparts. Goosebumps: The Musical, based on the beloved R.L. Stine book series, is a play within a play within a play. The students of drama teacher Ms. Walker are given a haunted script, discover a chilling lair below the school’s basement, and are ghosted by a phantom who tries to stop the show from going on. There’s disaster afoot with ruined backdrops painted blood-red, an Egyptian tomb, and some fainting by the students in the process. Katie McClanan plays Brooke, a consummate drama geek who lives for the velvet curtain and green lights. She gets the lead, not just in Ms. Walker’s play, but also in solving the mystery of the phantom. Her best friend Zeke (Skylar Derthick) is as obsessed with the stage and plays second detective. They’re a tight duo, natural actors with bright singing voices. But once Brian (Brendan Long) the new kid comes along, a dynamic trio hits the stage and Goosebumps: The Musical poses a serious threat to screen time. Many charming moments are devoted to Brian and Brooke’s crush on each other. McClanan’s performance of Babbling Brooke is a love song to the nervous jitters when you try to make small talk with a cute boy. For most of Brooke and Brian’s time together, they’re with Zeke setting out to solve the mystery of the phantom. Like most kids they have a lot of demands: keeping up with homework, memorizing lines, and doing detective work. Playground politics and tensions create some static with the other students who get lesser parts in Ms. Walker’s production. The musical remains true to the bumpy road to adulthood, and kids will relate to the frustration and awkward moments. Tina (Sophia Takla) is the spunky go-getter of the class who really really wants to play the lead. She gets understudy and jack-of-all trades behind-the-scenes work. She plots for a while in her sweet solo Understudy Buddy, but toward the end she discovers she’s great working with the lighting and props. It’s easy to be drawn into Foote’s stage and the story, forgetting that you’re in a theater seat, at least until your neighbor gasps or laughs. For all of the readers out there who have obsessed over series like Goosebumps or The Magic Tree House, this musical captures the feel of these books. You’ll have fun, feel smart by getting the clues, and in a few years say: “Hey, I remember learning about this!” Goosebumps: The Musical is just like your trick-or-treat basket, full of surprises. Oregon Children’s Theatre’s Goosebumps the Musical: Phantom of the Auditorium continues through November 20 in the Newmark Theatre. Ticket and schedule information here.